No Diving or Jumping is a wooden architectural structure, a cabin painted yellow, erected on rough wooden piles, with three large Plexiglas windows. You walk round this cabin on a small terrace protected by a barrier, which is also painted yellow. But there is no ladder to help you climb onto the platform. Without making any clear reference to any identified use, this architecture comes from a surveillance structure. Surveillance of what? This is not a cabin that protects or hides the observer, as in the case of watchtowers or hunters’ blinds. The work’s title gives a clue about the probable place where the structure might be used. However, despite the title and despite the colour, Christophe Viart’s work does not manage to sidestep military or paramilitary imagery. 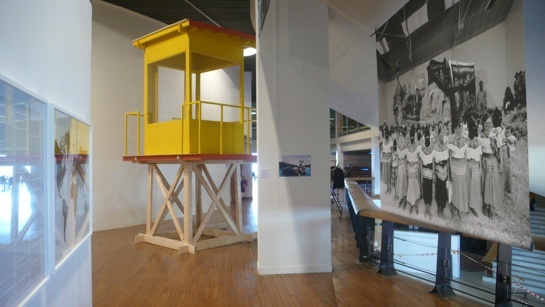 The positioning of the piece in the exhibition area on the first floor of the Maison de la Culture, right in the entrance, permits an evocation of caretaking. No Diving or Jumping is the result of two different journeys. The first was associated with the residency organized in Cyprus as part of the Suspended Spaces project in 2008; the second took Christophe Viart to Tijuana, in the state of Baja California in Mexico, a few months later. 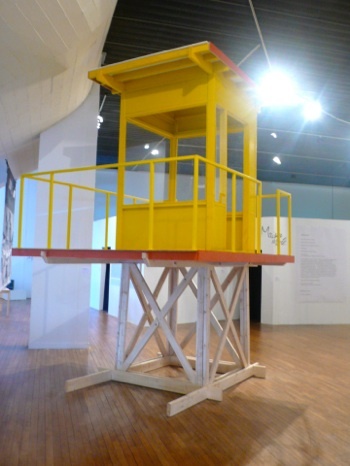 It was on the beach near that city, on the Pacific shore, a few yards from the U.S. border, that he took the photographs of the lifeguards’ cabin, and these served as models for the piece he then made. Christophe Viart went about this project in three stages. A group of architectural students first of all digitally modelled the structure, based on a single photo. Then technicians constructed the final work. So, the structure was photographed a first time, and then a semblance of volume was given to it through the digital modelling, before it was returned to three-dimensional space. The scale and the approximately accurate proportions, the colours and the materials are all so many translations and betrayals of the original form. The limitations of the vectorial modelling brought in simplifications and modifications of the initial form, while at the same time inventing what the photograph did not present (the door, the third window). 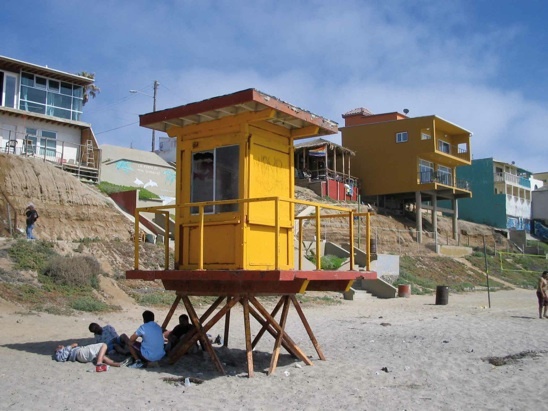 The construction restrictions also led to significant changes in the structure, mainly linked to the fact that the cabin on the Mexican beach is probably fixed to a concrete base hidden beneath the sand. Christophe Viart’s work, placed on the floor, calls for broader and more stable piles. As a life-size maquette rather than a readymade, No Diving or Jumping creates a representation and not just a displacement. No Diving or Jumping comes across like an emblem of the viewpoint, as a work involving copying, No Diving or Jumping combines the memory of the Tijuana beach with the encampments of families enjoying the sun on the sand, contrasting with the deserted expanse on the other side of the border, and the surviving image of Famagusta.